Sure, everyone has been talking about the cool GPU features in CS4. But, did you look at the new features in Camera Raw 5? Those extra buttons add Graduated Filters and Adjustment Brushes to the Camera Raw interface. You can now create some amazing effects even before you launch Photoshop CS4. Let’s take a look. 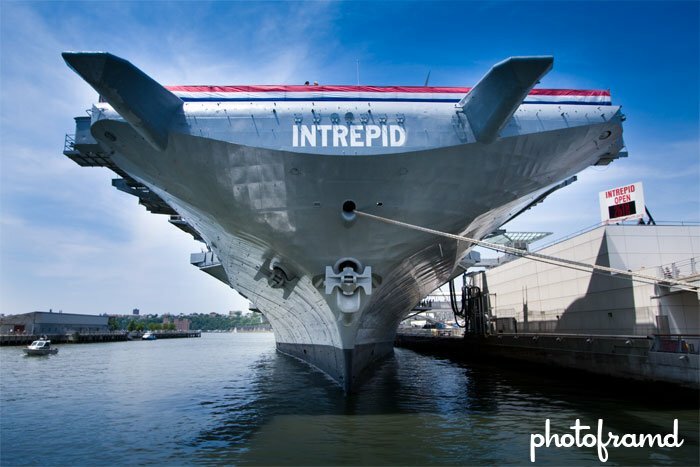 I took the original photo of the Intrepid Museum in NYC on a very hot sunny day while on line for the museum. The line kept moving, so I had little time to pull out filters. I just took the shot and hoped for the best. It was an ok photo … before Camera Raw 5. The results are incredible and completely natural. The Graduated Filters function like masks with benefits. Sure, you can apply a gradient of color, but you can also control Exposure, Brightness, Contrast, Saturation, Clarity and Sharpness. It’s a Gradient Mask with a built-in Adjustment Layer and it’s completely non-destructive. Pretty Cool! The Green Dot is the starting point and the Red Dot is the end point. Once in place, simply adjust the attributes using the sliders, and it applies to the masked area between the dots. To darken the sky, I am decreasing the Exposure and Brightness, but increasing the Saturation, Clarity and Sharpness while adding a great blue tint. The Gradient Filter can be adjusted just by clicking and dragging either dot. Or, it can be cleared entirely. If you like the results, click either Done or Open Object and the effect will be saved with raw file. To get rid of that pea green water, I added a second Graduated Filter starting from the bottom up. The settings in this filter are completely independent of the first filter and can even overlap. 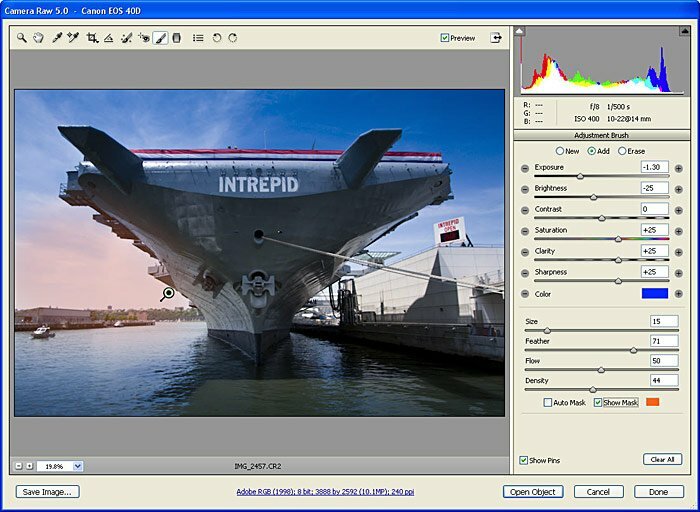 The sky on the side of the Intrepid is still too bright, but can be darkened by using the Adjustment Brush. It works like a Quick Mask; simply brush to create the mask. You can even adjust the Brush Size, Feather, Flow and Density of the brush stroke. Again, the Adjustment Brush is completely independent of the Graduated Filters. Just one last tweek. The overlapping Graduated Filters darkened the Intrepid as well as the sky. 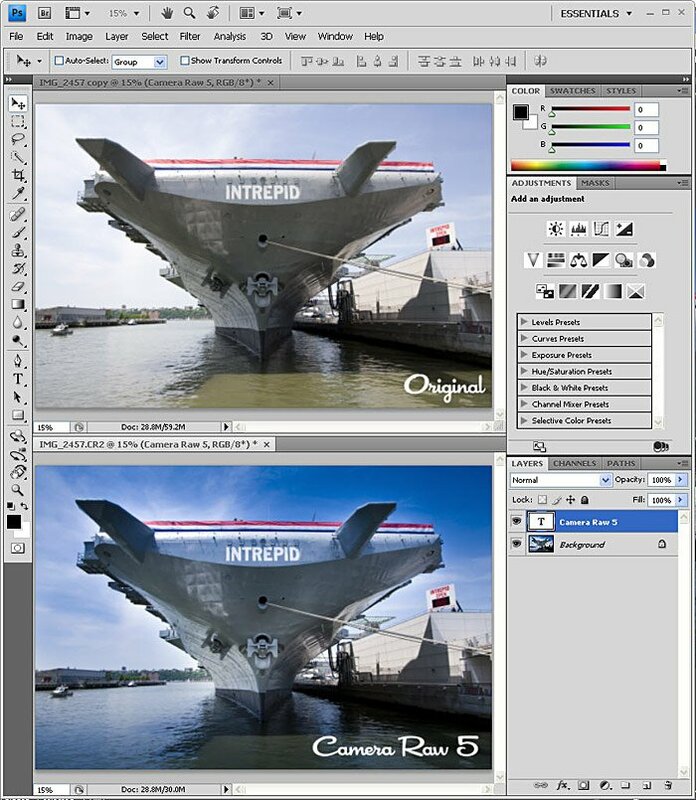 I created one last Adjustment Brush to lighten the Intrepid and increase the Contrast. The results are impressive and completely modified through Camera Raw 5!